Nour Alideeb, chairperson for the Ontario branch of the Canadian Federation of Students, speaking at a rally in Toronto on December 9, 2017. Photo: YouTube screenshot. 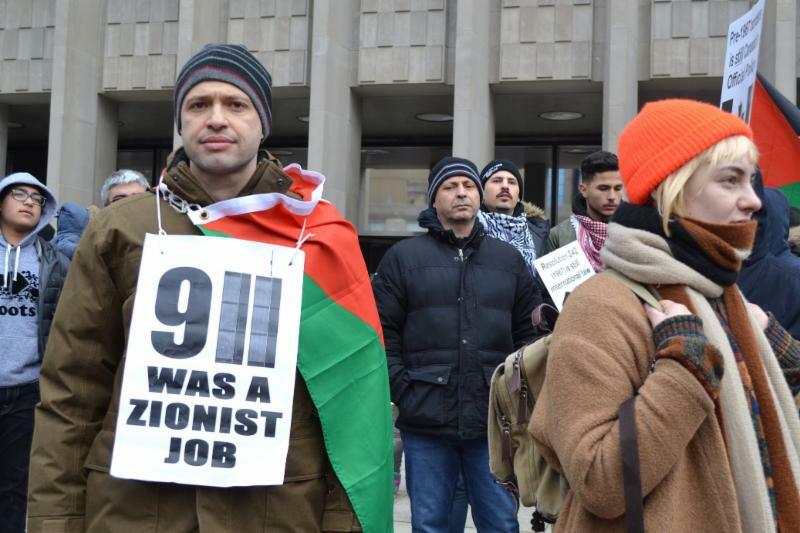 A Canadian student leader is facing criticism after making inflammatory comments against Israel and Zionism at a rally earlier this month. Nour Alideeb, chairperson of the Ontario branch of the Canadian Federation of Students (CFS), spoke at a demonstration held on December 9th in front of the US Consulate in Toronto, in protest of President Donald Trump’s recognition of Jerusalem as Israel’s capital. “We have asked the CFS leadership to review Ms. Alideeb’s statements in light of the mandate she holds,” said FSWC head Avi Benlolo. FSWC told The Algemeiner that while it has not yet heard back from CFS, the Toronto Police Hate Crimes Unit is currently reviewing the complaint. Alideeb’s claim that Zionism — the movement for Jewish national self-determination — stemmed from white supremacy is being increasingly promoted by anti-Israel activists. The term “antisemitism” was coined in the 19th century by German propagandist Wilhelm Marr in an effort to make Jew-hatred sound more scientific, and is exclusively recognized as denoting such bias by the Oxford English Dictionary, Merriam-Webster Dictionary, and Encyclopædia Britannica, among others. The Ontario branch of CFS unanimously voted in 2014 to support the boycott, divestment and sanctions (BDS) campaign against Israel. Leaders of the movement — launched by Palestinian groups in 2005 — have repeatedly acknowledged that it aims to end Israel’s continued existence as a Jewish nation-state. Alideeb and CFS did not immediately respond to requests for comment.